Lot Detail - Guy Carbonneau's 1992-93 Montreal Canadiens Stanley Cup Finals Game-Worn Captain's Jersey with LOA - Stanley Cup Finals Patch! Guy Carbonneau's 1992-93 Montreal Canadiens Stanley Cup Finals Game-Worn Captain's Jersey with LOA - Stanley Cup Finals Patch! Led by the heroics of Patrick Roy and some timely scoring by the Habs forwards, Montreal unexpectedly advanced to the 1993 Stanley Cup Finals where they faced off against Wayne Gretzky's Los Angeles Kings. 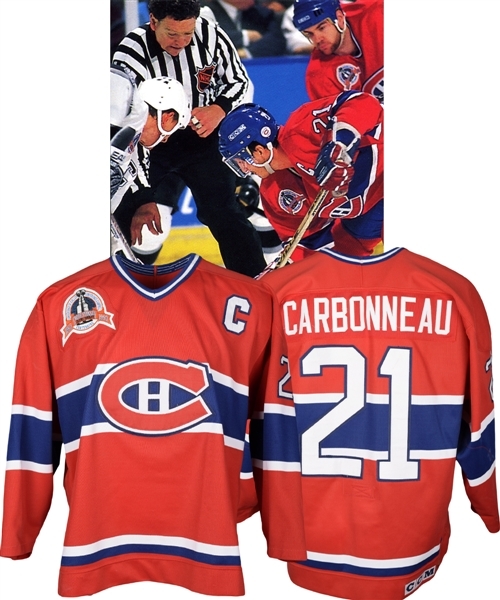 Guy Carbonneau shadowed Gretzky all series long, and played an important role in the Canadiens’ 24th Stanley Cup Championship. 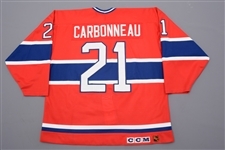 This Montreal captain’s jersey was worn by the all-star centerman in the 1993 Stanley Cup Finals. 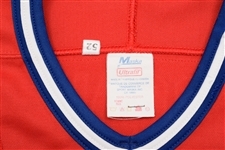 The proper Maska Ultrafil tagging and size “52” tag remain attached to the collar, with embroidered NHL and CCM patches on the back bottom hem. Styled with hockey’s most famous logo, the jersey has been accented with attractive dual-colour twill captain’s “C” and numbers on the sleeves and verso. 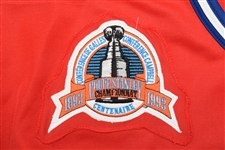 The scarce Stanley Cup Finals patch is affixed to a swatch of red knit material that has been sewn over the NHL's commemorative 100th Anniversary Stanley Cup patch on the right breast. Comes with an LOA. 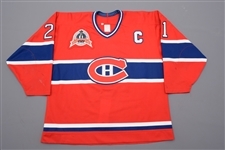 We should note that the Canadiens' wore their red jerseys during games 3 and 4 of the Cup Finals in Los Angeles. Visible game-wear includes a few faint marks on the lower front including a tiny hole, with additional marks and board burns on each sleeve including a pair of small resulting holes present near the left elbow. 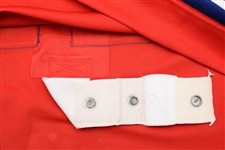 There is also some loose stitching around the collar. Auction closed on Wednesday, June 15, 2016.